• A Glut of Abnormal F2 Neurodevelopment in One Family: Did Grandma's 1960s Pregnancy Drugs Induce F1 Fetal Germline Errors? • In Case You Missed it: Three F2s with Autism: Did 1965 Synthetic Hormones Drug Mom's DNA? A Glut of Abnormal F2 Neurodevelopment in One Family — Did Grandma's 1960s Pregnancy Drugs Induce F1 Fetal Germline Errors? More autism family germline drug exposure stories coming next month. Three F2's with Autism: Did 1965 Synthetic Hormones Drug Mom's DNA? 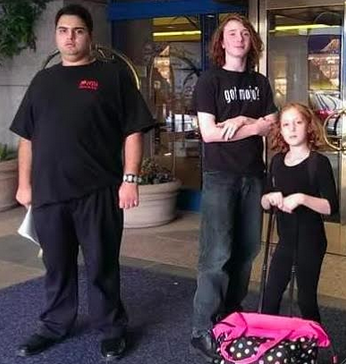 ​Read here about Joan Hutchen's three children with autism. 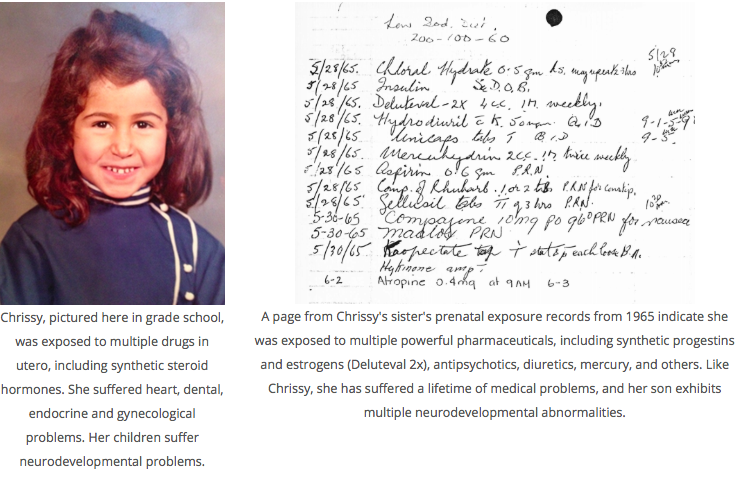 Like Jill Escher, mother of two children with idiopathic autism, and Chrissy Young and her sister, see above, Joan had been prenatally exposed to "anti-miscarriage" synthetic hormone drugs as a fetus in the 1960s. These lab-created evolutionarily novel substances with steroid-like properties had direct access to germline DNA, and may have had the effect of inducing epigenetic programming errors in nascent gametes, resulting in dysregulated neurodevelopment in the F2 generation, pictured above. See our latest RFP (below) focusing on the investigation of exposure history in autism multiplex families. Autism is highly heritable without being "genetic" in the classic sense, and its rates are skyrocketing, up 28-fold in California's DDS system since 1987. We hypothesize that a subset of ASDs arise from induced epigenomic and/or genomic disruptions of parental germline during the vulnerable phase of fetal germline synthesis. This new RFP asks investigators to look at F2 ASD multiplex families to probe this idea, with an emphasis on ascertainment of F1 in utero pharmaceutical and other acute exposures in the 1950s, 60s, and 70s. RFP details can be found at: germlineexposures.org/grants. New Q&A: David Moore, PhD, on "The Developing Genome"
Our latest Expert Interview features David Moore, PhD, author of the new book, "The Developing Genome: An Introduction to Behavioral Epigenetics." In 2001, he published the groundbreaking "The Dependent Gene: The Fallacy of Nature Versus Nurture," arguing against the dominant paradigm of genetic determinism and for an understanding of development and biology that accounts for environmental and cellular context in how genes are expressed and ultimately in how traits develop. The new book continues those themes, while emphasizing the molecular basis for developmental shifts. This SFARI article discusses exciting new research by Johns Hopkins' Dani Fallin, PhD: "Women who have unusual patterns of chemical tags on their DNA during pregnancy may give birth to children who develop autism symptoms.... Chemical tags such as methyl groups can turn genes on or off and may appear in response to environmental triggers...."
Oxford University Press has announced a new journal, Environmental Epigenetics —an international, peer-reviewed, open access journal, with Michael Skinner, PhD, at the helm (pictured above). Environmental Epigenetics publishes research in any area of science and medicine related to the field of epigenetics with particular interest on environmental relevance. Fields including medicine, biology, evolution, molecular biology, toxicology, ecology, social sciences, chemistry, systems biology, and bioinformatics are welcome. The journal publishes Research Articles, Reviews, Technical Briefs, and Perspectives. Mini-grants in the $250-$5,000 range are available on a rolling basis to support meetings, papers, research, or other work related to investigations of the induced germline disruption hypothesis of autism. Simply email us with your inquiry.